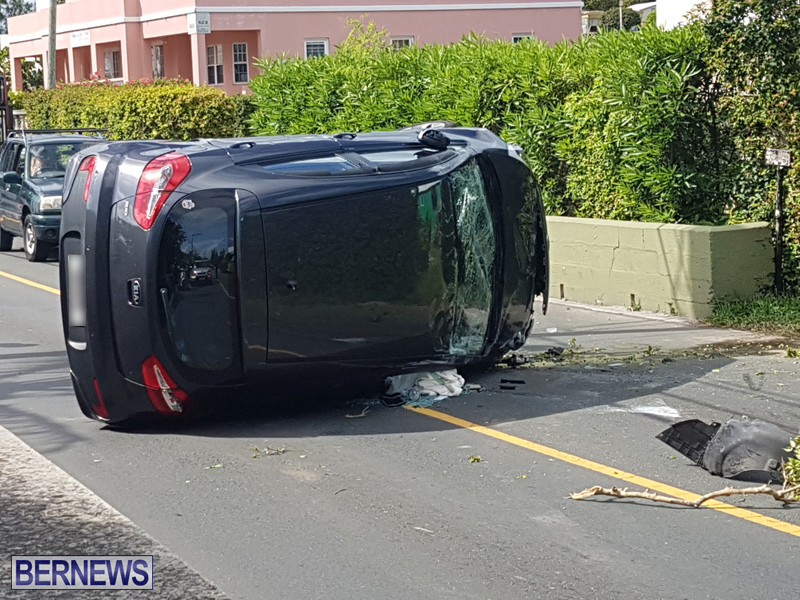 [Updated] A car crash occurred this afternoon [June 27] in the west end, with the collision resulting in the car landing on its side and traffic being temporarily restricted in the area as emergency services responded to the scene. Further details are limited at this time, however we will update as able. 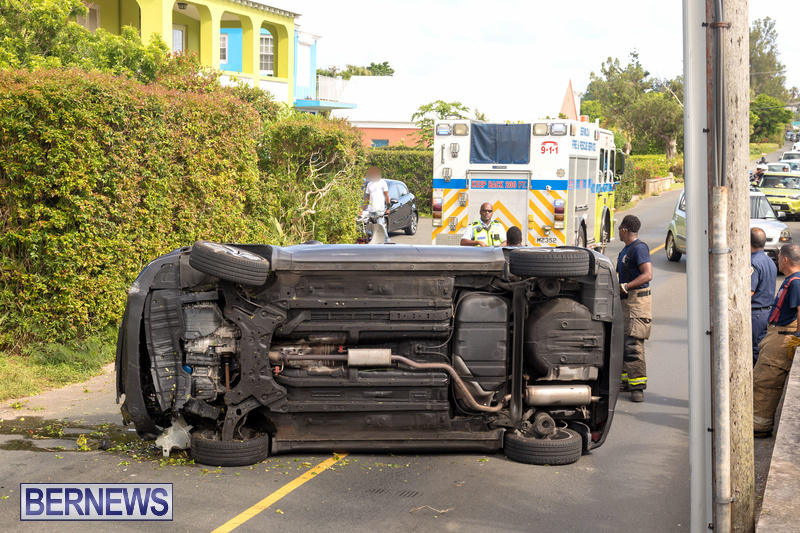 Update 5.55pm: The police said, “Police responded to report of a single vehicle RTC that took place at 4:21pm. 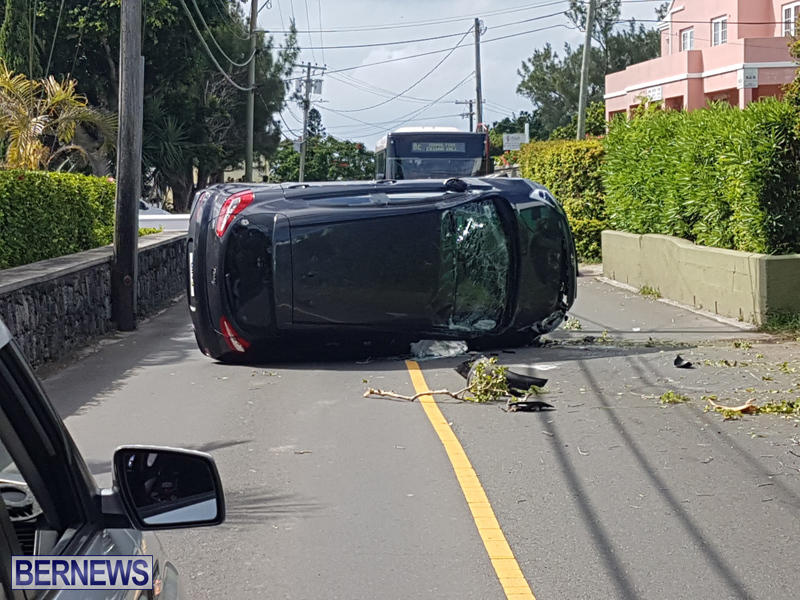 It appears that a 75-year-old female was driving her car on Middle Road in Sandys [Hog Bay Level] when she lost control her car resulting in the car hitting a curb and turning over. 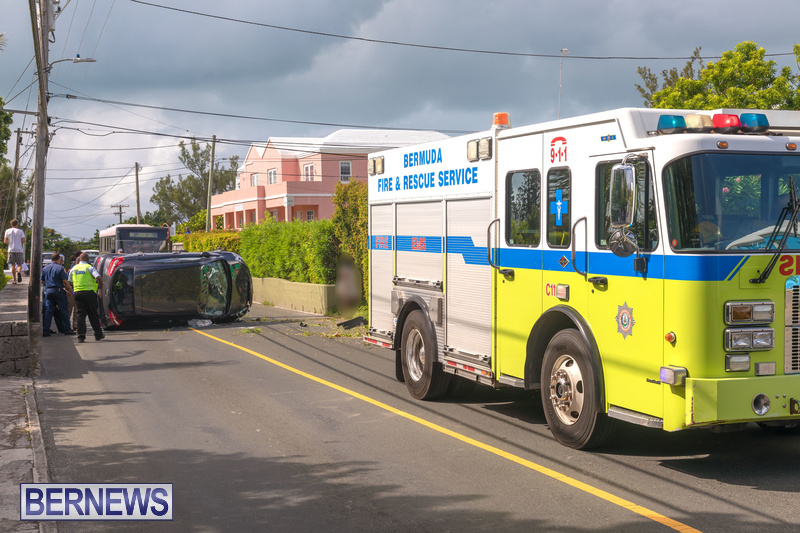 Update June 28, 11.53am: A police spokesperson said, “Around 4:20pm Wednesday, June 27th police and fellow first responders attended a reported single vehicle car crash on Middle Road in Sandys parish near the junction with Store Lane. 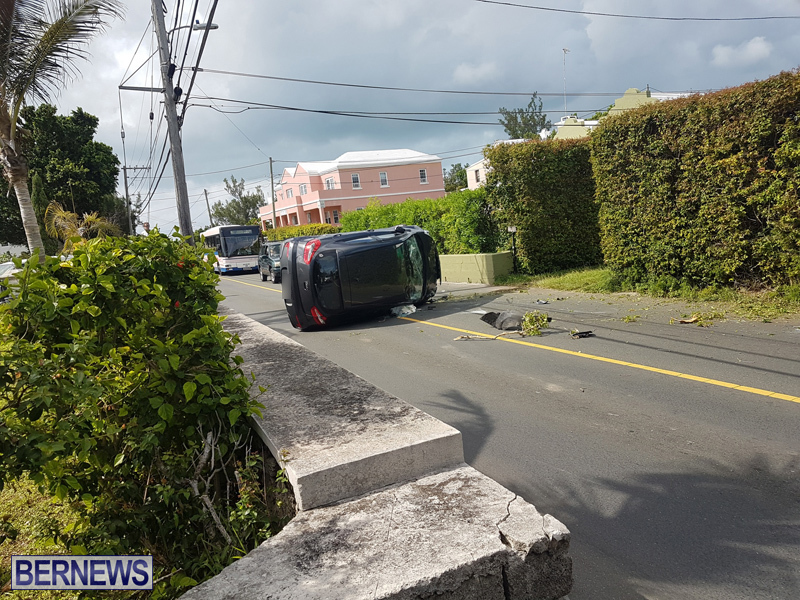 “It appears that a 75-year-old Sandys parish woman was driving a car along the westbound lane of Middle Road, in the vicinity of Hog Bay Park, when the vehicle struck a hedge on the opposite side of the road and overturned, ending up on its side. 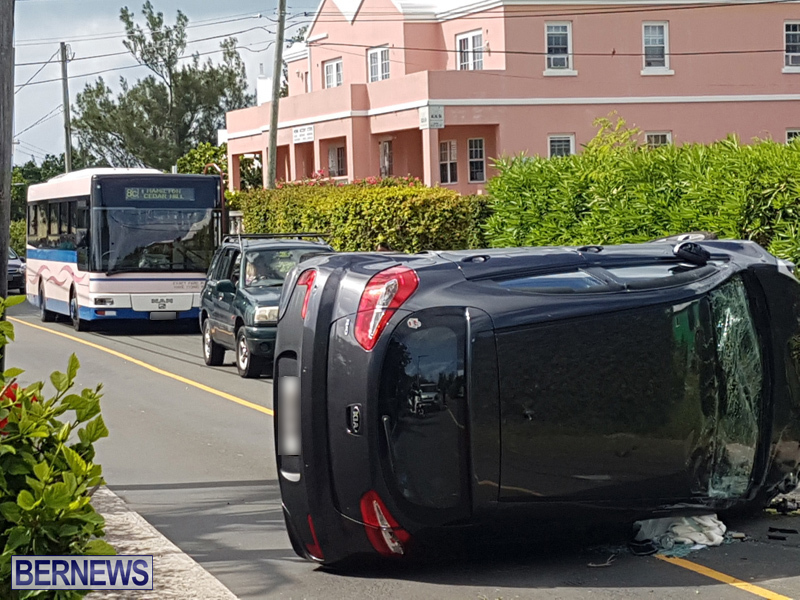 “The 75-year-old woman was transported to King Edward VII Memorial Hospital via ambulance for medical assessment and later discharged. 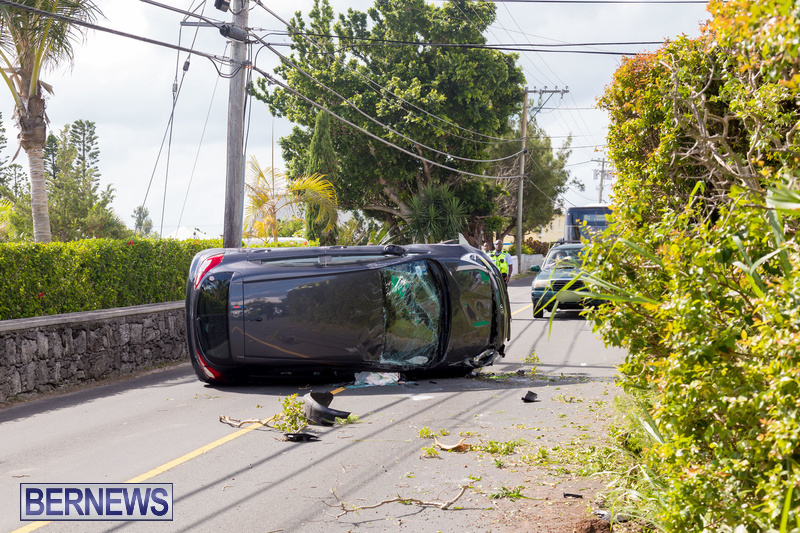 “There were traffic delays in the area following the collision until the damaged car was towed from the scene. A straight stretch of road. Amazing observation. Maybe you should change jobs and start looking at the sky to predict the weather. I feel like your inner a***** is just waiting to burst out with this passive aggressive comment, so come on, let your inner a***** out so we can all see it in its glory hole. Wasn’t speeding, not at all. Those fuzzy number plates will get you every time!! Thanks Mike. Not sure what you mean by this. Cue all the armchair experts who are puzzled at how a car can end up on its side on a straight stretch of road. “Only in Bermuda” they will proclaim – as if this never happens anywhere else. And references to the speed limit are farcical as the speed limit is 35 kph. A speed limit that EVERY SINGLE motorist in Bermuda disobeys. Well it is ridiculous. It’s every day. not puzzled at all… hit the hedge and rolled over!! doing 25mph!! 100% spot on Pat. I always come here for all the expert comentary from all the Bernews experts on every & anything. No worries. New cars arrived today, you’d be back on the road in no time..
It’s literally an epidemic of bad driving here. How do drivers like this even pass a drivers license test??? The unofficial race day for SUVs in that general area is Sunday mornings. Thank you Family for that update. A medical emergency while driving sadly does not fit the narrative of those who will use this as an example of the mayhem on our roads. The same people who never obey the speed limit, slam on breaks to let people out of junctions, rubber-neck at everything they see while they drive, complain that they never see police anywhere, etc, etc. The ‘wannabe police officers’ who complain about everything! Speed kills! There is no diversion in this area. Charge the motorist for the business interruption costs. Thanks for your amazing business insight, but it was after businesses were closed and just so you know, she fainted and had no control over the vehicle **** face. She is an amazingly good person, happens to be 76 and just had a mild stroke, so next time have some consideration before you ejaculate your ‘opinions’ on someone else’s life situation. I’m sure you are an upstanding Christian who will be awarded the ‘Jesus Christ Perfect Person Award’ when you get to your fluffy clouded abode no doubt. No namr – Thank you for standing up for her. She did indeed have an overcoming. For anyone that actually cares, she is very shaken up and upset that this happened and thanks to these comments from everyone that seems to know what happened without actually being there or talking to her, she is very embarrassed and glad that no one else was involved. Firstly, let’s hope she is ok. Regardless how this occurred, it is like a demolition course on our roads! Aside from accidents due to mechanical or unforeseen events; the general driving habits are disgusting, witnessed every single time I go for even a short drive. We need to address this immediately. It is not just the guilty ignorant driver that we need to worry about; it is the innocent collateral victim: which in truth could be anyone. The traffic enforcement division needs to be increased according to the need! Two days ago I saw a “private” garbage truck slide down Cobbs Hill Road (it was raining) right onto Middle Road and had to just make the turn real quick. Fortunately no one was right there for him to hit. But it shows, anybody innocently driving along could have been killed. I know as soon as I see a police bike, or that “ghost radar man” I quickly check everything—speed, seat belt. If people would just quit being in such a desparate rush to get somewhere it would make a big difference.